Every Friday morning I load three full boxes into my car. The boxes have about fifty small bags of food: collated packets of shelf-stable items like oatmeal, cans of soup, ramen, juice boxes, fruit strips, granola bars. The boxes are grocery store industrial strength. 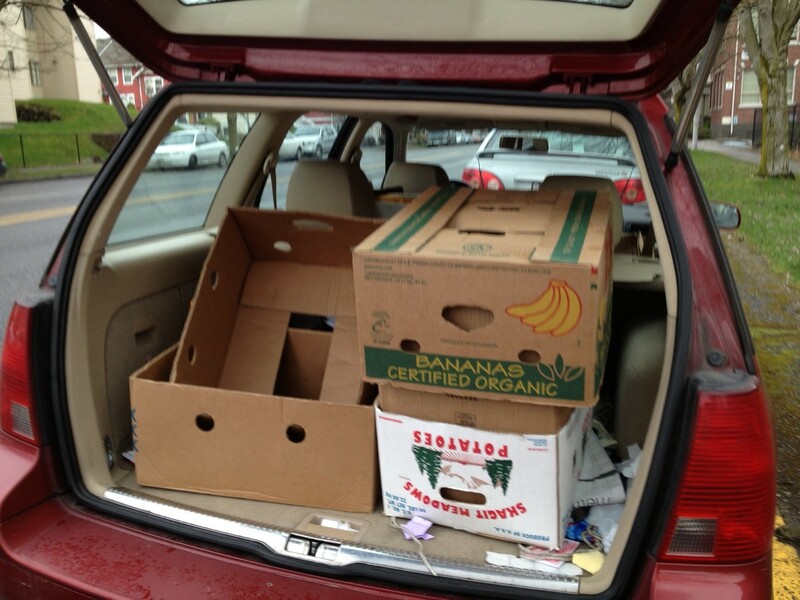 The outsides of the boxes usually indicate their contents (“bananas,” “potatoes”). Every once in a while, the individual bags contain fresh food: oranges or apples. I drive the boxes to a nearby school in my city, unload them, and take the empty boxes back where they can be reused. Each week’s delivery is supposed to feed about twenty-five kids for one weekend. The kids can take two bags each. Twenty-five kids: that’s about one classroom’s worth of kids. Multiply that number by eighteen, and that’s how many kids the program serves around the school district: 450. About a school’s worth of kids who face the risk of being hungry over the weekend. The school where I deliver food is a middle school. Middle school: a place where it can feel excruciating to stand out, where any sign of difference, including class difference, is reason for exclusion at best and bullying and taunting at worst. So I wonder about this school where I deliver food. It’s a school where the numbers of identified students in need have doubled, just this last week. I wonder about the students who are unable or unwilling (for whatever reason) to accept the food that I’m delivering. I also wonder about the life that my oldest child is living. She attends a school in the same city where the kids are regularly encouraged and exhorted about once a quarter to donate (“just one more can”) to food banks. She’s come with me to help on some of these delivery runs, and she’s used her own earned allowance to donate to the school food drives. I’m proud that she asked her father to buy a sandwich for a young man outside a bookstore in Portland, because the young man had a sign saying that he was hungry. And yet we learned this lesson in Portland from our daughter: It’s one thing to see the full boxes, to see the food that’s being given. It’s another thing to see the hunger. Hunger: not just the questions of “Where are we going to eat tonight? or “What am I going to make for dinner tonight?”, although these are also important. The hunger I’m thinking about today is the issue of food security, or not having enough to eat. I can write my way around a fancy menu status update on Facebook, often as a way of clutching at a moment of anticipated pleasure, or inviting others virtually to my dinner table. Then last year I wrote about making sandwiches at the food bank during a teacher strike. That event was enough to make me want to volunteer for the food bank, at least once a week. I know that it is very little, and still not enough. But it is something and I have to hope that there are many other people who also contribute somethings. Last year I had seen it for myself: every food writer must eventually face the topic of hunger. Most food banks that I know don’t have a paid publicist, social media coordinator, or corporate marketing strategy. Their energies seem to go towards one cycle: food in, food out. The backpack program depends on a small team of staff members, volunteer groups, community donations, and volunteer packers and drivers like myself. So when I received a press release from my food bank, I didn’t want to rewrite it and resend it out, which (ahem) happens far too often in news cycles. The press release highlights the expansion of the backpack program, which has just expanded to more schools and even another school district. Since I’ve been volunteering the number of assisted students and schools has only gone up, not down. At first I think that this rise is a good thing–and it still is–until I start to think about how that means that more kids have gone hungry. And I am sure that there are more kids who have not been identified by hard-working counselors or staff or teachers, who also need assistance. This week I found out that three boxes is not enough now for this middle school. The list of identified students in need has doubled, the school staff informed me. When I passed the news on to the backpack program coordinator, he was worried that the program will not have enough resources to meet this new need. The three boxes will probably, hopefully, turn into six. I have enough room in my car, but I don’t know if I will have enough food to take for the fifty kids–now two classrooms’ worth–at the school. On Friday mornings I think about my mother. Her practice of generous, abundant giving is one I’m still trying to learn and model for my daughters. After my dad died she raised me and my sister by herself, on a single fixed income. But I have memories of her, even after my dad died: taking food to people, gleaning food from people’s yards and giving it to them (complete with recipe suggestions). I remember how she took in friends of ours who just needed a place to stay for a few months. But we always had enough to eat. To read more about food security in the United States, start at the USDA site. Statistics are available by state and region as well. The Feeding America program can help you locate your nearest backpack program through your local food bank.. I volunteer at the Backpack Program through St. Leo’s Food Connection in Tacoma. In Washington State, Northwest Harvest operates a backpack program, Three Squares, for eight school districts, including Seattle.